Every block, a.pass organizes ‘b-workshops’ that focus on the basic principles of a.pass as a working environment. ‘How about Critique, Criticality, Crisis?’ ties in on a field already explored by ‘Feedback and Critique’ in July 2012. Whereas the previous workshop focused on several feedback techniques to clarify the nature(s) and function(s) of feedback within a collaborative and self-organized artistic research environment, this one will focus on the challenging issue of ‘critique’. 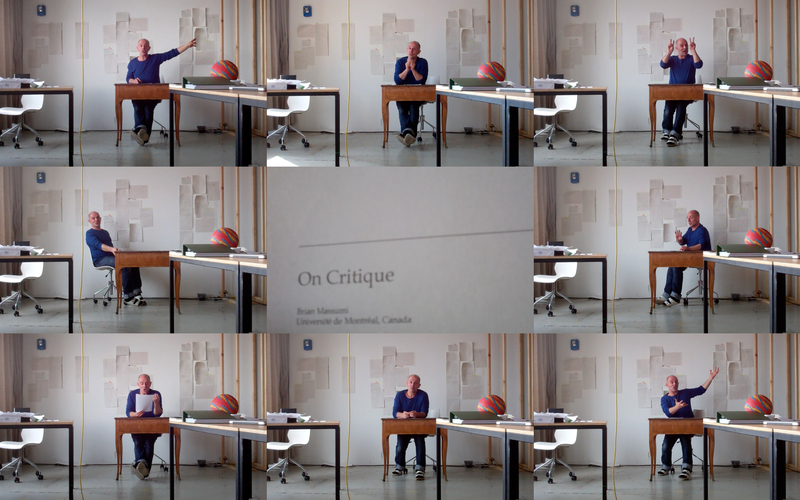 What does critique aim at, and how does it epistemologically operate? How can we deal with its problematic relation to judgement and truth? What’s the relevance of critique within a system of criticality to overcome the vicious circle of belief and denunciation? What’s the role of discourse and theory in one’s research and practice in order to go beyond backing up one’s work but rather challenging it, eroding it, posing problems to it? Is discourse solving the crisis of practice or should it rather impose a crisis on practice? From critical readings of several texts on critique and criticality to film and performance analysis, from case studies to role playing, we will come up with refreshed definitions of critique and renewed objectives of uncompromising aesthetic. A reader will be announced in time.